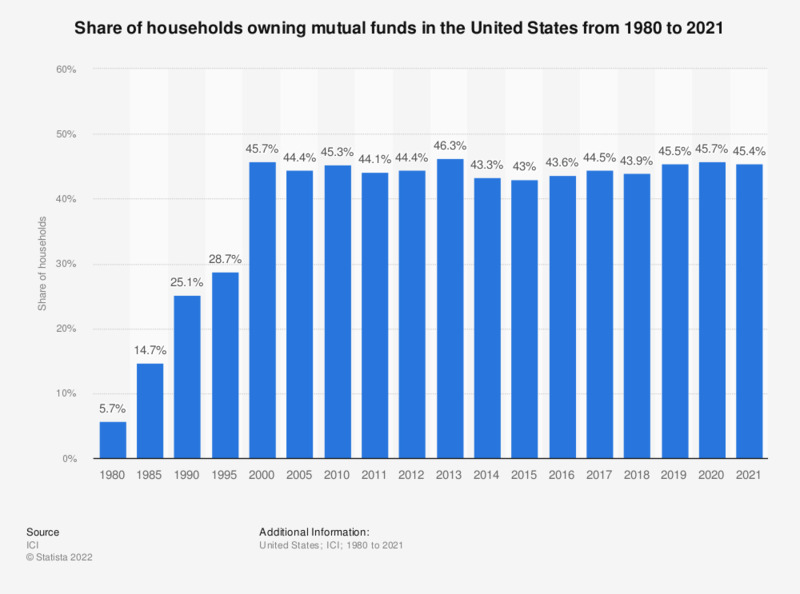 The statistic presents the share of households owning mutual funds in the United States from 1980 to 2017. In 2017, 44.5percent of the households in the United States owned mutual funds. A mutual fund is a variety of collective investment vehicle, managed professionally that pools money from many investors in order to purchase securities. They play an important role in household finances in the United States of today, most notably in retirement planning. It is commonly applied only to the forms of collective investment that are regulated and are sold to the public at large. The majority of mutual funds are what is known as ‘open-ended’, meaning that shares can be bought or sold at anytime. There are a number of advantages associated with mutual funds as opposed to direct investment in individual securities. The nature of the fund as a collective investment vehicle provides increased diversification and ease of comparison to investors. The fact that they are managed professionally, and that the investment is pooled, enables participation in investments that would normally only be available to larger investors. Mutual funds are also stable in price as daily liquidity ensures minimum loss of value. Despite several advantages, as with every aspect of investment some disadvantages are to be taken into account. Fees are an inevitable part of a professionally managed fund, as is the inability to customize the investment. A common complains is also that the investor has less control over timing of the recognition of their gains. Mutual funds owned by American households are at a steady rate and have moved scarcely a percentage point since 2000. The source adds the following information: "The survey methodology was changed to a dual frame sample of cell phones and landlines in 2014."